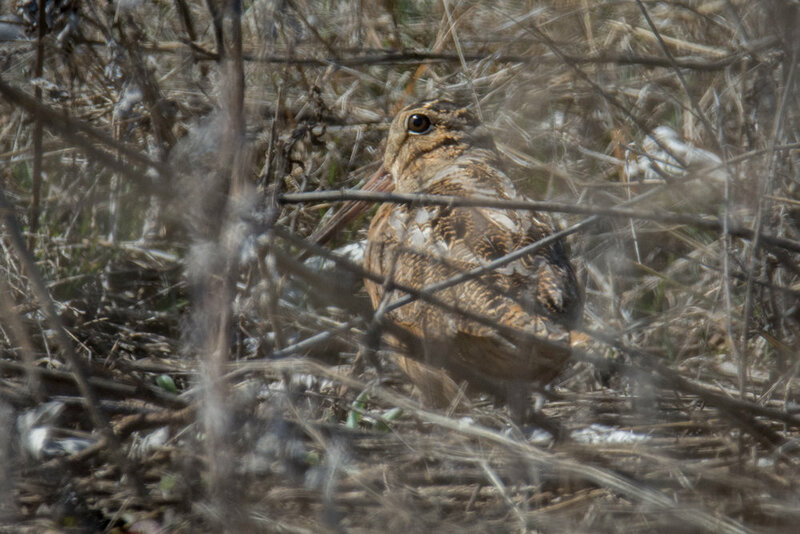 I know, I know, the correct name is American Woodcock, but in Michigan we always called it Timberdoodle, which sure seems a better fit for this comical looking bird. Short legs, stubby tail, long beak, and buzzer-like call, they are very well camouflaged, and they will sit still in the low grass or shrubs until you just about step on them. Then up they shoot, with a loud flapping of wings and a soft whistle. It's like the bush just exploded at your feet, and it's made me just about jump out of my boots countless times. On very few occasions, I have been lucky to spot one before it flew away. And even more rarely, I have been lucky enough to spot one that happened to be sitting in a place open enough to get a decent photo. Last spring, in fact, I was lucky to see one right in our tiny Chicago back yard. The Woodcock moves along the ground with a strange rocking waddle movement, poking its long beak in the soft ground looking for earthworms, grubs and similar food. It shows up in spring just as soon as the ground has thawed about enough to poke a pencil in without breaking. This time of year the males are doing their impressive courtship display. At dusk they find an open area, often near the edge of a marsh. They circle it fast in the air, then land near the center of the circle that they just flew. After a few "buzz" sounds, they shoot about 50 feet straight up in the air, flutter around a bit, and then shoot straight back to earth. Their wings make a whistling sound during this up-down dance. Over and over, up and down they go; it really is cool to watch, against a dark blue early evening sky. You can find videos on YouTube, but there's nothing like hearing and seeing it first-hand. Many different birds pass through the Chicagoland area during the spring migration, but for me the Timberdoodle has always brought with it a feeling of wilderness in the heart of the city. I'm really grateful every time I see one, whether it scares me to death or not!